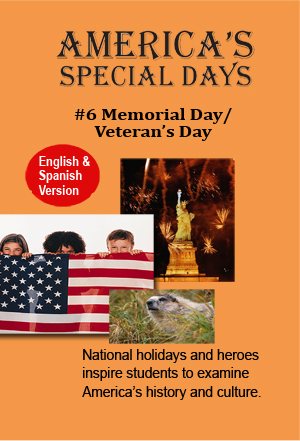 America’s Special Days salutes Memorial Day (May 30th) and Veterans’ Day (Nov 11th) with our guide, Francesca. The program examines the ceremonies and commemorations to show respect for those who serve or have served our nation. The program begins with the changing of the guard at the Tomb of the Unknowns at Arlington National Cemetery. Visiting children from Tennessee place a wreath at the tomb. “Taps “ is played and the flag is displayed at half staff with the Custis-Lee Mansion shown in the background. Francesca and her grandfather share facts about Memorial Day and Veterans’ Day. Other monuments are shown, as well as several Memorial Day and Veterans’ Day activities.